Dr. Seuss’ Birthday is coming up on March 2nd and every year I am reminded of a story one of my kindergartener’s parents told me. She had been living in California at one point in time and had the opportunity to go to Dr. Seuss’ house and he would sit in a rocking chair with his “Cat in the Hat” hat on and read his books to whomever came to listen. How great would that have been!! I was just trying to see if there was any information online about this and while there wasn’t, I did learn that he did not have any children of his own. When asked about this he would respond, “You have ’em; I’ll entertain ’em.” Love that! Last year at this time, I decided that incorporating some Dr. Seuss activities in My Obstacle Courses would not only allow me to reinforce something he was doing in school, it also gave me a great opportunity to work on other skills. 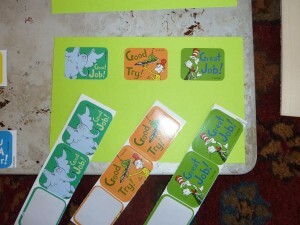 I found some Dr. Seuss stickers at the teacher store and used them in a “Make the Same” station activity to work on visual discrimination and also the fine motor skill of peeling and sticking the stickers in the right order. 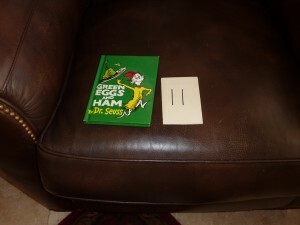 Reading a Dr. Seuss book out loud or having your child read is a great station activity to incorporate reading skills like listening, comprehension (understanding what is read), and fluency (one’s reading rate, use of punctuation for pauses and also using expression). 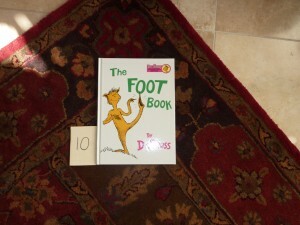 If your child is reading, I suggest taking turns with books like this, which can be long. 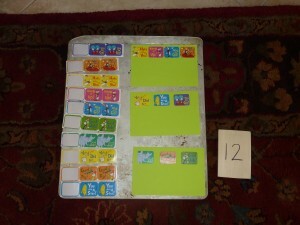 The goal of this is to practice reading skills in a fun way, not to tire them out. Children who struggle with reading tend to use up a great deal of “energy” decoding the words they are reading, leaving them less able to answer questions about what is happening in the story (comprehension issue). This is why it is important to stop and point out what is happening in the story. Talking through stories helps to keep them engaged in what is going on and to see the purpose of reading as an enjoyable activity and/or a way to get information, not just to get through a bunch of words so they can move on. Here is a link to the Dr. Seuss Suessville website (I turned down my volume because the music while loading is a bit much 🙂 ) where there are games and activities that you may want to use with your child. These are really easy and basic ways to reinforce something your child may be learning about in school into My Obstacle Courses. I love doing this because Andrew always gives me a look like, “I’m doing that in school and YOU know about it too?” This doesn’t just apply to Dr. Seuss but can be done with any theme, skill or concept you may find on the teacher to parent home letter.